Cirrus Des Aigles clocked a new course record time of 2m 02.52s in becoming the latest French raider to annex the QIPCO Champion Stakes with a brilliant three quarters of a length victory under Christophe Soumillon. But there was a sting in tail for the jockey who received a five-day ban and forfeited both his prize money and riding fee for striking the horse six times in the final furlong, one more than is permissible under the new whip rules. The five-year-old gelding (12/1) tracked Irish powerhouse So You Think throughout the 10-furlong contest and quickened past the 7/4 favourite inside the final quarter-mile before hanging on under the Belgian rider's strong drive. Corine Barande-Barbe's charge is the 22nd French-trained winner since 1945. 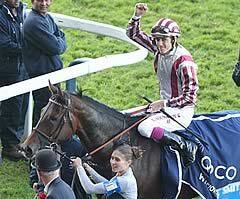 Soumillon was delighted with Cirrus Des Aigles, a prolific winner in Pattern company who, although a regular in Group One races in Europe and the Far East, was scoring at the highest level for the first time. The jockey commented before the stewards' verdict: "When he won races in Deauville in August, he won by eight lengths and 10 lengths in soft ground, really easy, and beat Group Two horses, so it was the mark of a champion. "Unfortunately, every time he went overseas it was very good ground and he didn't have good draws but today we had everything for us. The ground was just soft enough, good draw, and perfect race in behind So You Think - that gave us every chance. "The horse is really amazing because if you see how many races he has had already this season, it's unbelievable to see his condition. He was completely on top form today. "He runs every race in every type of countryside racetracks like Vichy, Deauville, everywhere, and he wins Listed and Group races all over France. He ran the Japan Cup and in Hong Kong, so everyone knows him in France. He is like a mascot and today, seeing him do what he did, it is unbelievable. He was up against some of the best horses in the world at the distance and to beat them like that is something really special. "I am already surprised because the race is at Ascot instead of Newmarket. 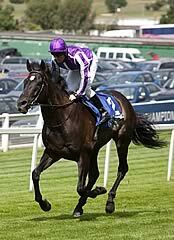 I was second on Pride and today I have won it with a famous horse like him, so I am really proud and now I hope I have the same chance with the Epsom Derby. Soumillon also had a word for the team and particularly Franck Blondel who has been in the saddle for all but two of the gelding's last 20 races. He said: "I am very happy for the team because it is a small stable and is something special for them. I would also like to say a little word for his jockey, who rides him in France, Franck Blondel, he is a great rider and unfortunately (for him), today they asked me to ride the horse." Australian champion So You Think produced another top-class performance to finish runner-up in the QIPCO Champions Stakes. The son of High Chaparral was fourth in the Prix de l'Arc de Triomphe 13 days ago, but while that race was punishing, So You Think still gave his all and finished just three-quarters of a length behind French raider Cirrus Des Aigles, who set a track record. Aidan O'Brien said: "He ran a stormer. The boys [his owners, Messrs Smith, Magnier, Tabor, Tan and Yahaya] will decide on future plans. He's a big horse with a big heart and must be some horse - they breed them tough in Australia." Ed Dunlop, trainer of third-placed Snow Fairy - who was just half a length behind So You Think - said the filly would attempt to retain Japan's QEII Stakes which she won last year. In that race she is likely to face Dancing Rain, who won today's QIPCO Fillies' And Mares' Stakes. Dunlop added: "She's run a great race, but I'd like to watch it again, because people are saying she was still on the bridle and boxed in a little bit [inside the final two furlongs]. We were watching So You Think and the winner has gone away, but our filly has run well. "She ran well in the Arc when third and she's held her form. I'm glad we brought her here."